Here’s a year that might have gone a few different ways, Number One-wise. The top spot could have been Day of Wrath, a magisterial, overwhelming work; it could have been The Life and Death of Colonel Blimp, as nimble and insightful a movie as ever sustained itself over 163 delicious minutes. 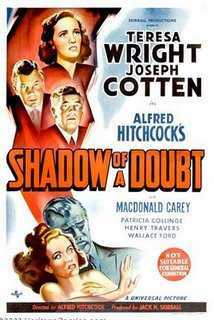 But 1943 saw Alfred Hitchcock really on his game, and in Shadow of a Doubt Hitchcock hit a perfect blend of the sinister and the humorous. Neither the genre appeal nor the crafty comedy of Shadow of a Doubt should disguise the incisive look at how a family operates and how a small town lives and breathes. Hitchcock (and the writing team that included Thornton Wilder, Sally Benson, and Frau Hitchcock) sinks into this in an unusually complicated way; the warm presences of Joseph Cotten and Teresa Wright have a lot to do with the movie’s power as well. A pretty dark year; even the Lubitsch comedy is about going to Hell. As for The More the Merrier, it’s a movie that should be cited more often when people invoke the best comedies of the era, and a great example of how comedy can thrive under rigorous direction. Just missing the list are Clouzot’s fearsome Le Corbeau, and Billy Wilder’s Five Graves to Cairo, which is one of those “minor” Wilders that sometime seem more valuable than the majors (not to be confused with The Major and the Minor, which came out a year earlier). “Shadow of a Doubt” is my favorite Hitchcock film. I especially love dangerous tension in the bar scene between Cotton and Wright and the working class commentary from the waitress.